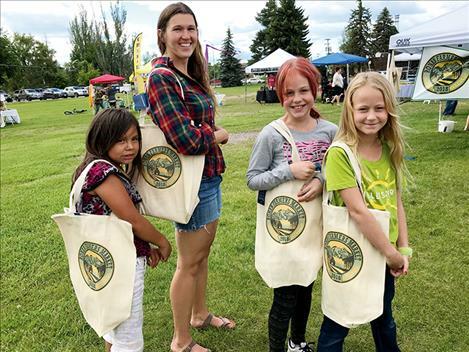 Phoebe Webb joins young shoppers in displaying the new Ronan Farmers Market tote bags. RONAN – The Tote Bag Challenge kicks off at the Ronan Farmers Market on June 21 during the summer solstice. Shoppers can earn a canvas tote bag, designed by Image Quest, by spending $25 at the market. Visit the market on Thursdays from 4 to 6 p.m. to sign up and pick up a punch card from market manager Jaci Webb to fill up with purchases. New to the market is a booth sponsored by Lake County Community Development Corporation featuring an array of products packaged through the Mission Mountain Food Enterprise Center. Free food and nutrition activities will be offered for the kids, starting in late June. More information on the activities will soon be available. While at the Ronan Farmers Market, make sure to sign up for the email list to get weekly updates. The market will begin accepting SNAP coupons later this summer and is already accepting Senior Food Coupons through the Lake County Council on Aging. People can stop by the market and visit with Dara Rodda for more information on the Senior Coupons or contact Rodda at 406-676-2367. One of the newest vendors is Ulyana Oie, who will have fresh lettuce, radishes and rhubarb in June and strawberries and raspberries in July. A popular vendor this summer is Ciella Whitsett who sold out of her popular fresh-squeezed lemonade at the June 7 market. She also offers muffins. Laura Shannon’s plum tarts and asparagus-topped focaccia bread have also been big sellers. Most of the fresh fruit and greens served with Shannon’s treats come from her acreage in St. Ignatius. A perennial market favorite is the Flathead Lake Cheese company. Wendi and Joe Arnold are a jovial couple, always willing to offer a free sample of their cheese, which is made with milk from the Mission Valley. The Ronan Farmers Market is currently seeking additional vendors who have honey, farm eggs, produce or locally sourced meat to sell. For more information, contact market manager Jaci Webb at jaci.webb@lakecountycdc.org or 406-698-3312. See you at the market.